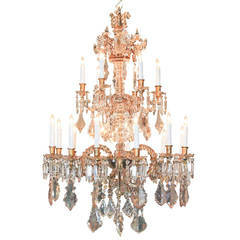 Great 19th century French 15-light gilt bronze and beaded crystal chandelier. 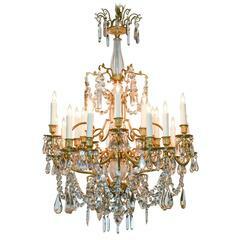 Elegant nine-light 19th century crystal and bronze chandelier. Minimum height fully installed is 34" with some additional chain. 19th century French bronze and crystal birdcage chandelier, circa 1840. Originally a candle chandelier that has been electrified. Faceted crystal spires accented with smoke crystals.